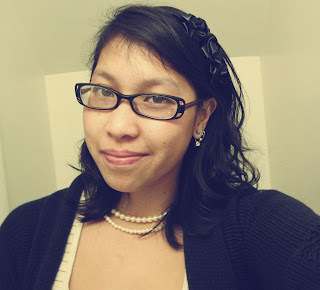 Last New Years Eve, with no real plans in mind, I was over come with a need to make a fancy headband. Earlier in the week I had tried on one at Anthropologie, which while I adored, I didn't want to spend 32$ on it. Yeah. So I did my best with no real time to make something similar. This is what I came up with. I'm quite happy with it and it was easy peasy. So here are the steps. 3. fold and loop ribbon on top of itself while twisting a couple times (this took me some experimenting to figure out how I liked it) take a stitch to secure it in place. 9. look at your creation, wear it and feel all fancy. 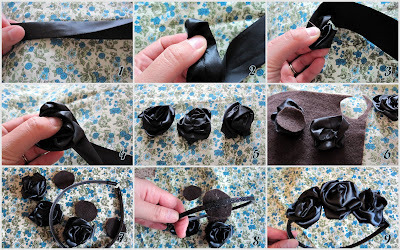 So there you go, now you can make your own rose headband. Or if you're my sister, you can look at mine while it's on my head, ON MY BIRTHDAY, and ask to borrow it for later that day.